The fact that the water in this spring was hot, was clear evidence to the ancients that the gods were at work here. Thus, this was also a sacred site. In 69 A.D., the Romans built a temple to Minerva (equivalent to the Greek goddess Athena) by the side of the Sacred Spring. In the temple and its adjoining courtyard, they made sacrifices and worshiped. Today, the foundations of the temple and associated buildings have been excavated. A raised walkway takes visitors through it. A digital reconstruction gives an idea of what it would have looked like in Roman days. Two extraordinary relics are on display in this area. 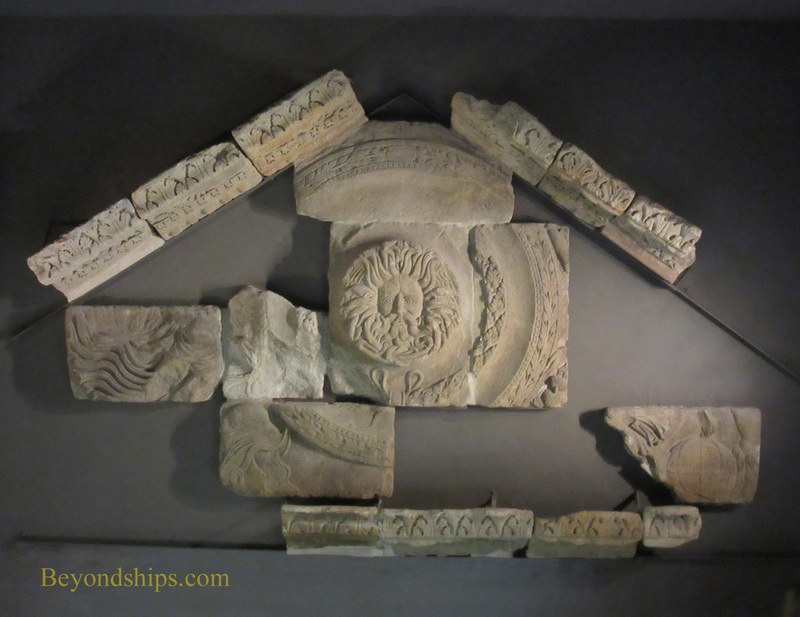 First, is the remains of the pediment to the temple, which once stood atop four columns nearly 50 feet (15 m) above the entrance. Its most prominent feature is the face of what is believed to be a gorgon at the center. There is only one other such classical temple in Britain. Second, there is the head from a statue of Minerva, which would have stood inside the temple. Discovered in 1727, the head is made of bronze covered with gilt. Larger than life, it has been impressively lit. Above: The temple courtyard and foundations. The Roman Baths is not a sterile archeological site. Rather, the museum has made a considerable effort to bring it to life. There are traditional models of what the site once looked like but also, as mentioned earlier, digital reconstructions. In addition, there has been innovative use of video such as projections of figures onto the ruins to show how people used various areas of the site such as the cold plunge pool. And visitors can interact with staff members who are dressed in Roman costumes and who take on the characters of real people who lived in Bath in ancient times. In addition, there are exhibits of some of the artifacts that have been discovered at the site such as some of the 12,000 Roman coins that have been found. The Roman Baths are open every day except December 25 and 26. During July and August, the site stays open until late in the evening. There is an admission charge. A discount ticket allows visitors to see two other attractions operated by the Bath and Northeast Somerset Council - - the Bath Fashion Museum and the Victoria Art Gallery - - as well. Use of a comprehensive audioguide is included in the price of admission. It is available in several languages. 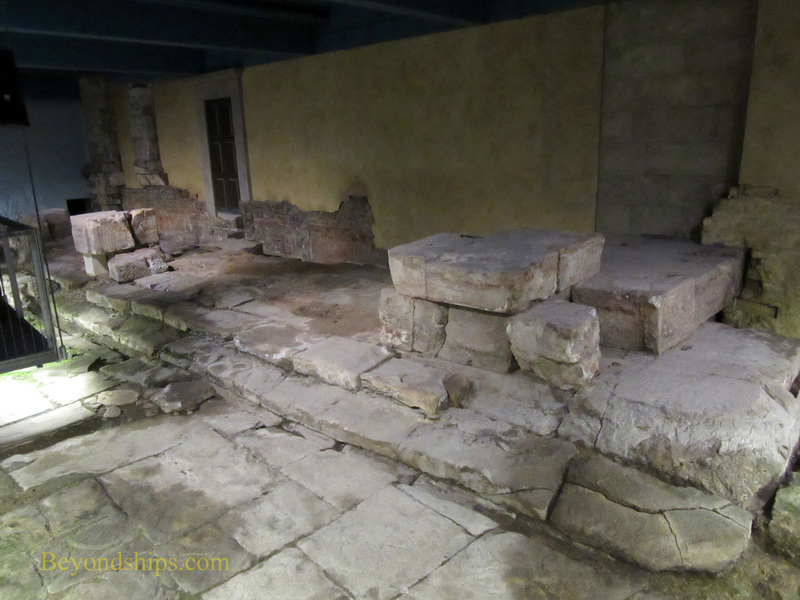 The Roman Baths has a shop as well as two restaurants - - the historic Pump Room and the more casual Roman Baths Kitchen. 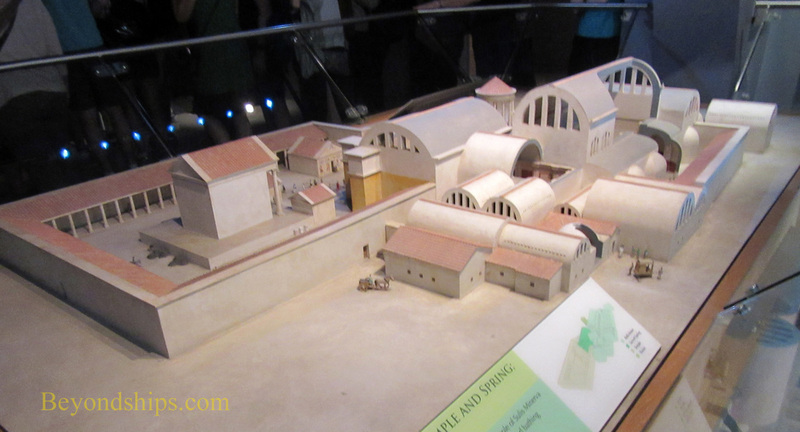 Above: A model of the site in Roman times. 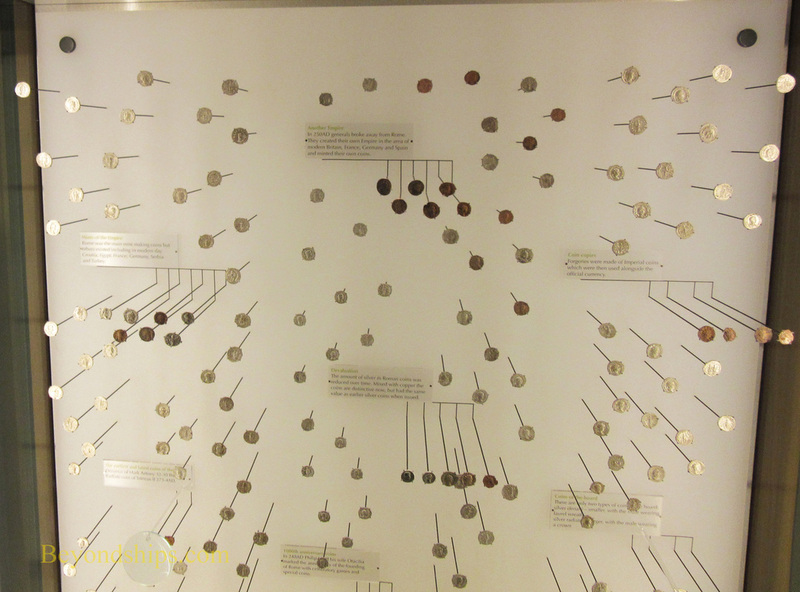 Below: An exhibit of Roman coins found at the site. Above: Part of the Roman drainage system used to transport surplus water away from the site.